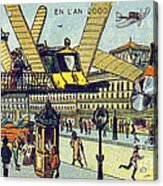 There are no comments for Flying Taxicabs, 1900s French Postcard. Click here to post the first comment. 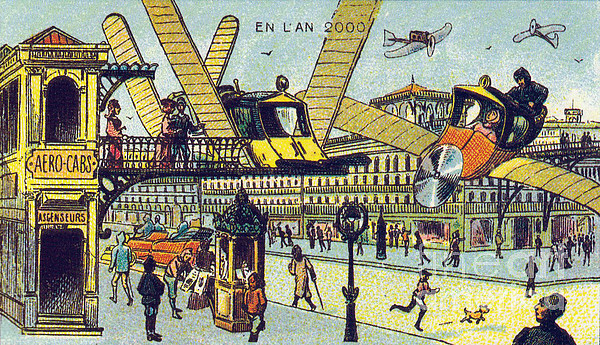 France in the Year 2000 (XXI century) a series of futuristic pictures by Jean-Marc C�t� and other artists issued in France in 1899, 1900, 1901 and 1910. Originally in the form of paper cards enclosed in cigarette/cigar boxes and, later, as postcards, the images depicted the world as it was imagined to be like in the year 2000. 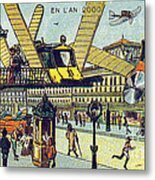 There are at least 87 cards known that were authored by various French artists, the first series being produced for the 1900 World Exhibition in Paris. The future and the concept of eternity have been major subjects of philosophy, religion, and science, and defining them non-controversially has consistently eluded the greatest of minds. Future studies, or futurology, is the science, art and practice of postulating possible futures. 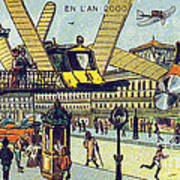 Futurists had passionate loathing of ideas from the past, especially political and artistic traditions. Instead, they espoused a love of speed and technology.